To Garmin: we have created a new verb: A Garmin is a GPS gadget which uses satellites to help you locate where you are and to route find; the more reference points you use, the more accurate your position. We have had to hone our Garmin skills re: whom to ask for information, whom and what to believe when we are given information, to get information from several sources, to consider the local context when people give us information and then to make our own decision based on our interpretation of what we have been told. Example1. 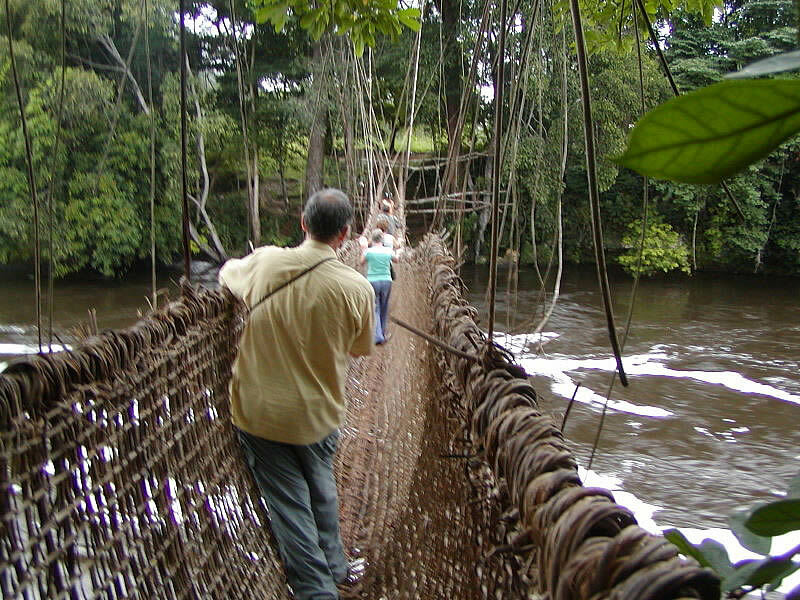 'Of course it is easy to travel through Baissa to Cameroun' - means, on a motorbike (which you can put on a canoe to cross the river) - because that is the local means of transport - so do not conclude that it is passable by car- as we did! Example.2 'If you leave now (09.00) you will be in Franceville by 14.00', means - because the only way I have ever travelled is by rail, that is the basis for my estimate' - thus we arrived in Franceville, by road, 36 hours later - we are learning to Garmin very quickly! We had an uneventful journey from Yaounde to cross the Gabon border at Eboro; proceeding to Bitam to stay at the Hotel Escale for one night. 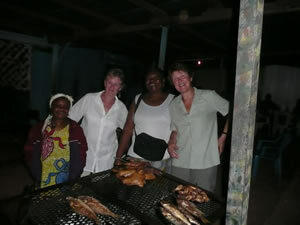 Enjoyed freshly barbecued fish in the town as an hors d'oeuvre. 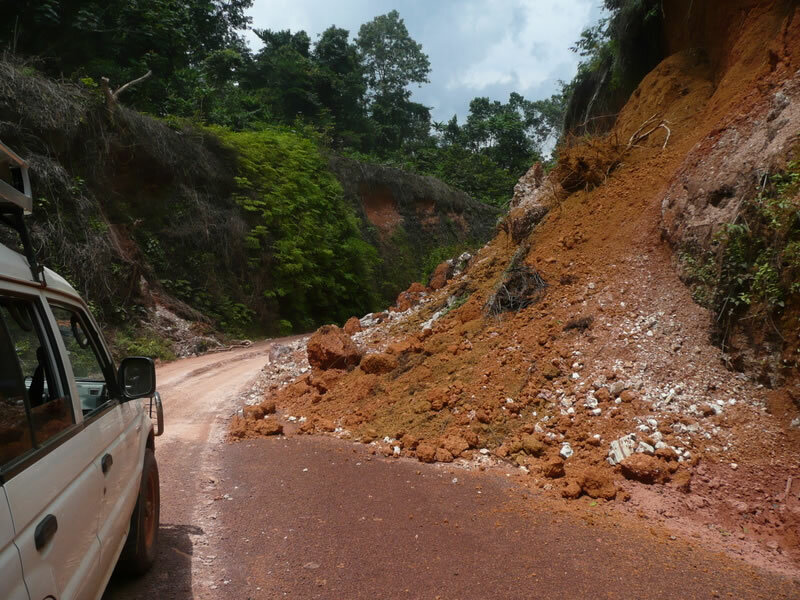 Saturday we travelled a magnificent road through endless tropical forest crossing the Equator, for the first time, near to Mekok Messeng, after which the road deteriorated reducing our progress to a crawl. Arrived at Ndjole just before dusk to stay at the Auberge St Jean, overlooking the Ogooue River - Gabon's equivalent to the Congo river. Here we were painstakingly served by an elderly retainer who reminded us of Julie Walter's character in Acorn Antiques and whom we nicknamed Mr Overall. Ndjole is a logging station where trucks (Grumiers), many with Chinese drivers, unload their huge logs for further transportation downriver in great rafts towed by a tug. We met some interesting people - Mustapha, a taxi driver from Ghana who spotted Mitzi and had to find out more and two English railway engineers who were surveying the Franceville railway track using ultra sound to check for cracks etc. 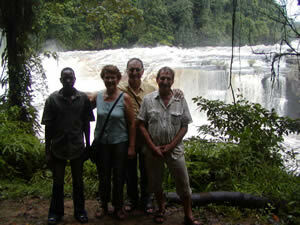 With each encounter we gleaned more information about places to visit in Gabon. Ndjole to Libreville - up hill and down dale on good roads winding our way alongside the Ogooue river for much of the way to Bifoun, after which the road deteriorated - it was rather like playing 'Space Invaders', dodging the plethora of pot-holes. In the centre of Bifoun was a roundabout of huge rocks painted in 'Zain' (mobile phone operator) colours - black and puce!! They have really gone to town on their mobile phone service advertising throughout the country. Libreville - The road into Libreville was pretty bad but once we hit the city boundaries the road surface improved again. Libreville is a smart modern city with several kilometres of promenade along the seafront. Sunday is obviously locals' day as the beaches were packed with swimmers and picnicers and looked very enticing after our long day's drive. 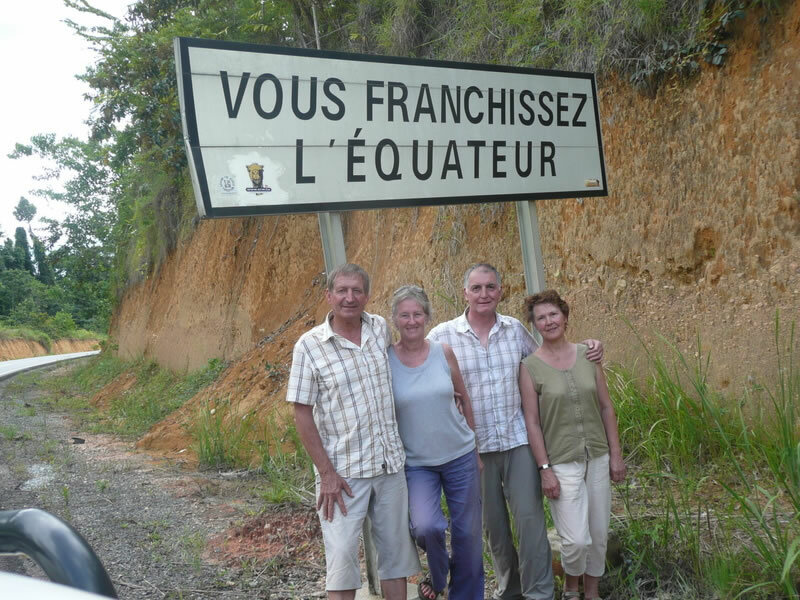 We booked in at 'L'Eclipse' in Quartier Louis - taking a 2 bedroomed apartment and enjoyed a couple of days self catering whilst we sussed out which National Park (of the 13 in the country) was best for us to visit. We decided on La Lope in the hope of getting to Mikongo where you can see and track gorillas. 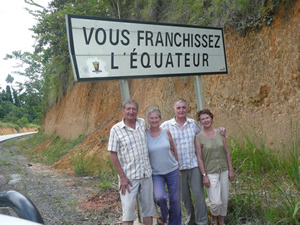 Also, it would be on our way to Franceville and through to Congo. 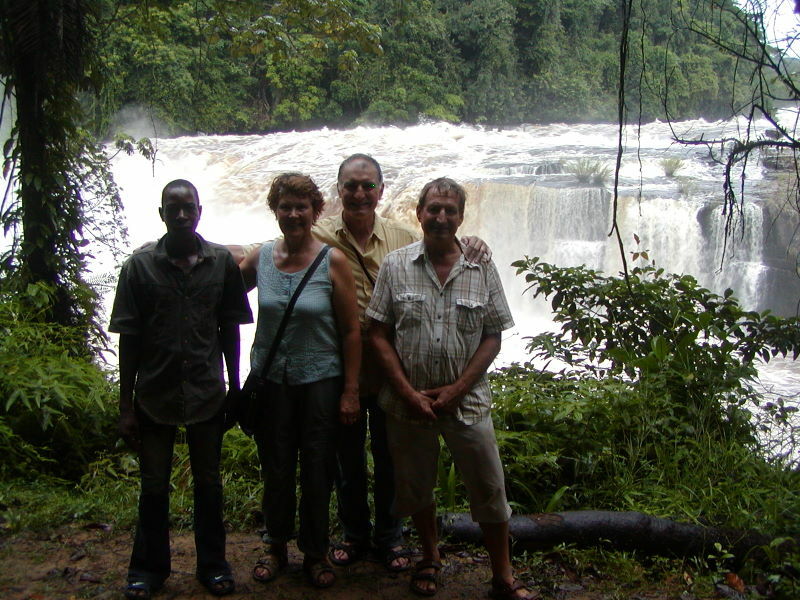 Getting to 'La Lope' meant back tracking through Ndjole and as we had a couple of days to kill, we went down to Lambarene, on the Ogooue river and the site of the Albert Schweitzer hospital. We spent the night at a Catholic mission, Mission Soeurs de L'Immaculee Conception, a lovely complex of cloistered red brick buildings in a peaceful garden across the road from the river. That evening we hit a local riverside bar for a beer and music. The following morning we visited the Schweitzer Hospital then made our way back to Alembe, the crossing over the Ogooue, via a very narrow bridge, and hit a really bad road; 100kms of mountain climbing and rough rocky roads in solitude - until we eventually arrived at the Ayem bridge across the Ogooue and finally to La Lope Hotel. 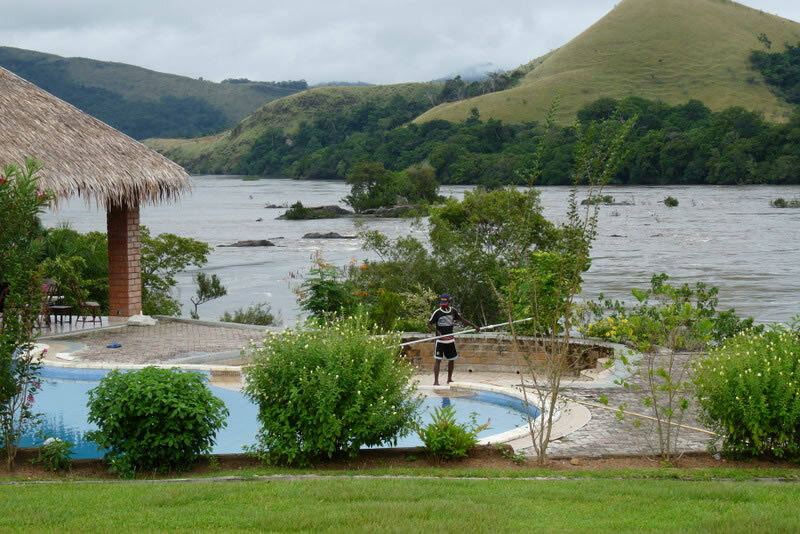 La Lope Hotel - is a very smart hotel in an impressive location, on a bend overlooking the river Ogooue, (bit expensive but worth it). 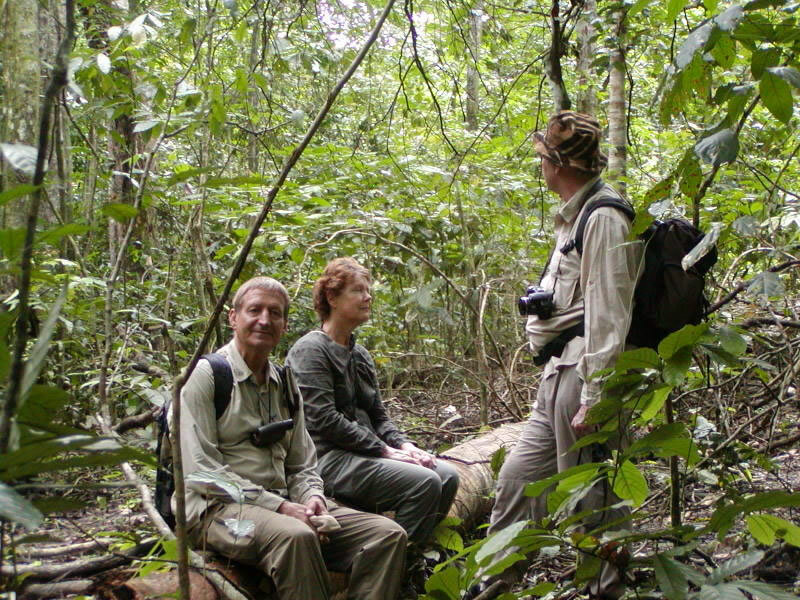 We went on a guided rainforest walk early next morning and saw monkeys, antelope and elephant (but only a very few - not the right season); in the afternoon we had a game drive and saw a few more elephants. Disappointing to see so few animals and birds but we were aware that this wasn't the best season to visit. Also we were very disappointed to be told that Mikongo was closed to visitors at present so we didn't have the chance to see gorillas. All the parks are very expensive and the Gabonaise operators are targetting the rich overseas visitors, which is a shame. Some places are only accessible by plane or a very long and rough road trip!! 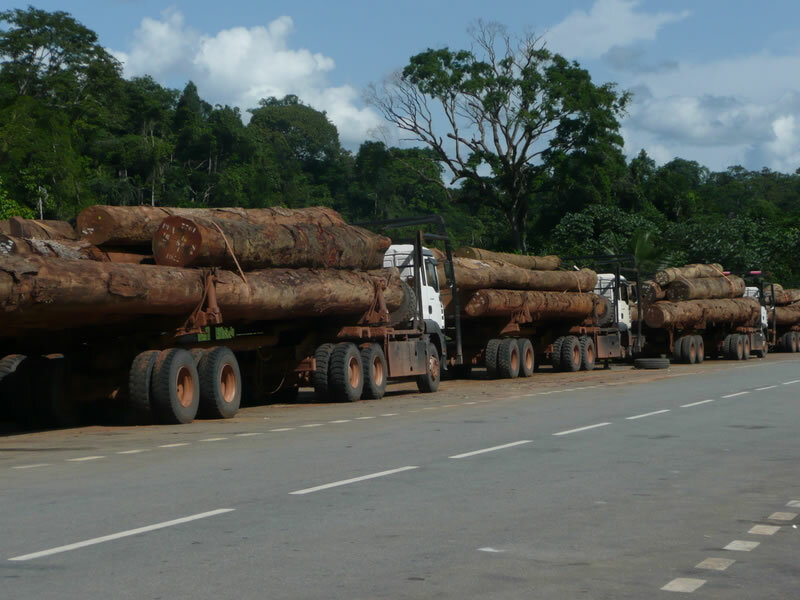 At Lope we met Inge, a Swiss, engaged in a 'sustainable development project' for a company called 'Precious Woods', they have a 600,000 hectare concession of forest from which they will take 1 tree per hectare - that is 600,000 huge Oume trees which will all be transported by rail from Lastoursville to Libreville. Libreville to Franceville Railway- fully opened in 1986 this magnificent, scenic railway is a lifeline for the Haute Ogooue Region of Gabon, in which we stayed, as well as being the means of transport to Libreville for thousands of logs from Gabon's huge forests and for thousands of tonnes of Manganese ore. The railway looked to be well maintained and was quite busy with commercial traffic; we met several people who had travelled on it with varying, but generally good, experiences. Lastoursville - never believe when someone says 'it will take only 3 hours'. Despite an excellent piste road, the journey from Lope to Lastoursville took us almost 5 hours winding its way up, down and round, frequently following and criss-crossing rivers through dense tropical rainforest. We could count on one hand the number of vehicles we saw over the whole journey. We decided not to press on to Franceville so found a very modest hotel for the night (Hotel Tchenga) and then hit one of the bars in town to enjoy some chicken, beef and fish - all freshly cooked on a charcoal/wood fire - and accompaned by a bottle, or 2, of Gabon Regab beer. Franceville- a good tarmac road all of the way we were told - two and a half hours later after driving on twisty and rutted piste through yet more mountainous rain forest, we eventually hit the tarmac and the countryside suddenly opened up into an endless green landscape of rolling hills and savannah grassland; similar to mid-Wales. We stayed at the Cristal Hotel (a good budget option) in self-catering apartments where once again we caught up on washing etc. We visited the chutes (waterfalls) and walked the very impressive liana river bridge at nearby Poubara; also the site of an existing hydro-electric scheme. Poubara was the focus of great Chinese activity in the construction of a new and bigger dam to generate more electricity for the region. 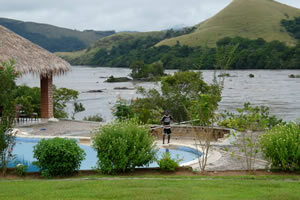 Next stop was Leconi, on an excellent road,100 km east of Franceville. The Leconi Hotel is under new management so the staff were very eager to please and accommodating. A very relaxed style where we weren't sure who was guest and who was staff, but the Patron cooked us a lovely meal of avocado salad, dorad (fish) with rice and ratatouille with extra hot pepper sauce followed by fresh pineapple. 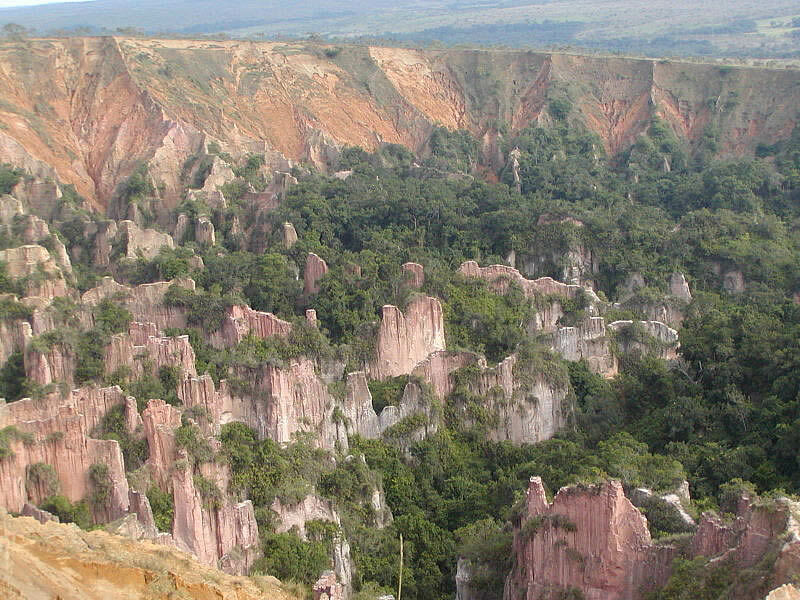 We visited the Leconi canyons, a unique geological feature, comprising two large craters with huge fingers of rock stickng up like sentinels, amidst the eroded surrounding terrain. 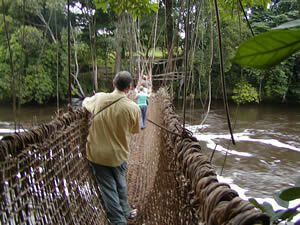 It is compulsory to take a guide (or tow) with you even though you could find your way quite easily. One guide watches the car whilst one guides you round the rim of the crater. A mound of broken windscreen glass was evidence that there had been a recent vehicle break-in by robbers so the authorities are becoming concerned about safety and more vigilant. We chose not to stay and visit the Leconi Reserve to see the animals that have been imported from Namibia but to crack on to Congo. The 40 km of good tarred road sudenly finished at Kabala and we then encountered incredible, endless, green rolling countryside (you could have been near Llyn Aled on the Denbigh moors) with a serpentine road of deep sand, interspersed with the occasional patch of forest, which continued all the way to Mbie (Congo border) and for a further 72km to Obouya to perfect Tarmac - such relief!